On June 9th, our sales manager Echo and Jessie set off for Philippines to visit the customers. They go deep into the site to understand the customers’ need and listen to the customers’ advice. After visit, they will give the feedback timely to our technicians, so that our technicians can know the operation of machines and solve the problems. 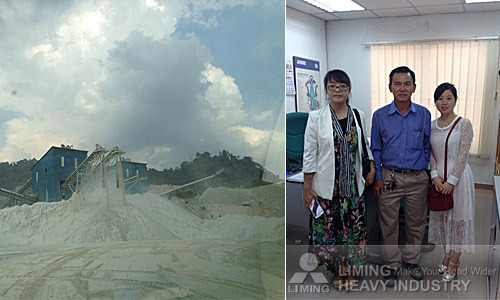 By virtue of the excellent service and high-quality equipment, Liming Heavy Industry wins praise from our customers. You can call our sales manager in Philippines if you want to know more about our equipment or you have some problem with the production line. The telephone number of Echo is 0060173527016.